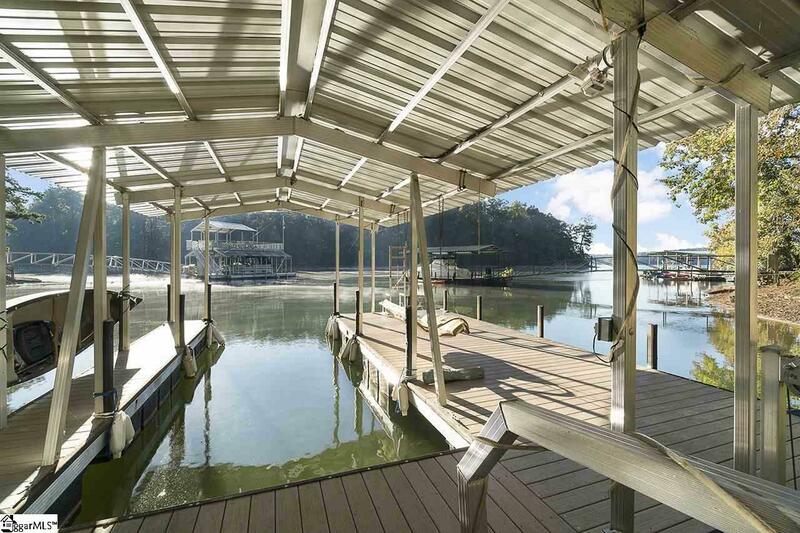 Enjoy this amazing lakefront 3 bedroom, 2 bath home with a like new aluminum covered slip dock with composite decking that includes power and 50' gang walk. Great water depth, exceptional views year round with calm waters. The cove is very quiet, great for swimming with little boat traffic. The property is Located on a quiet street with mostly full time residents. The neighborhood has a private boat ramp available to all homeowners for a non-mandatory $50 yearly key fee. The home is located just a few minutes off exit 4 on Interstate 85 and located at T20 on the Tugaloo River. This area of the lake is mainly underdeveloped, so the weekend boat traffic is very minimal. Only 10 minutes to Portman Marina. This street also hosts one of the more popular July 4th firework displays, front row seats from the dock.The home is in immaculate condition both inside and out! Lake views from the dining room, family room, and bedroom. A large living room with new "real" hardwoods, cathedral ceilings, and a real stack stone wood burning fire place. All duct work and HVAC was replaced in 2009. The home also has all new paint and floor coverings throughout the home. All new LED lights, ceiling fans, exterior lighting upgraded in 2018. The property has an excellent curb appeal with newer irrigation throughout the entire property. Enjoy the oversized screened back porch overlooking the water, along with an open back porch deck. Also, newer iron wood walkway all the way to the dock. There is a 2 car carport along with an oversized 2 car detached garage with power. Attractive exterior that was refinished 2 years ago. Home used as personal weekend getaway, therefore used very little and well maintained. Home shows well. Nothing on this street lasts very long. Agent Owned.